THE HAGUE – The Minister of Kingdom Relations, Ronald Plasterk contradicts reports that there is a mass exodus of Venezuelans to Curaçao. This is in reply to the questions posed by the Dutch party D66 in connection with the very disturbing situation in the South American neighboring country. The questions were raised concerning documents in the media about thousands of Venezuelan refugees. There has long been a lot of political and economic turmoil in Venezuela. 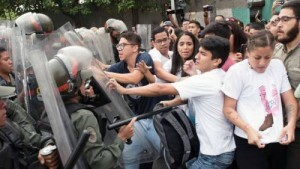 Last week the Venezuelan court pushed aside the parliament. Plasterk wrote to the Dutch Parliament that there is a slight increase of migrants trying to illegally reach the Caribbean part of the Kingdom and then return to their country.